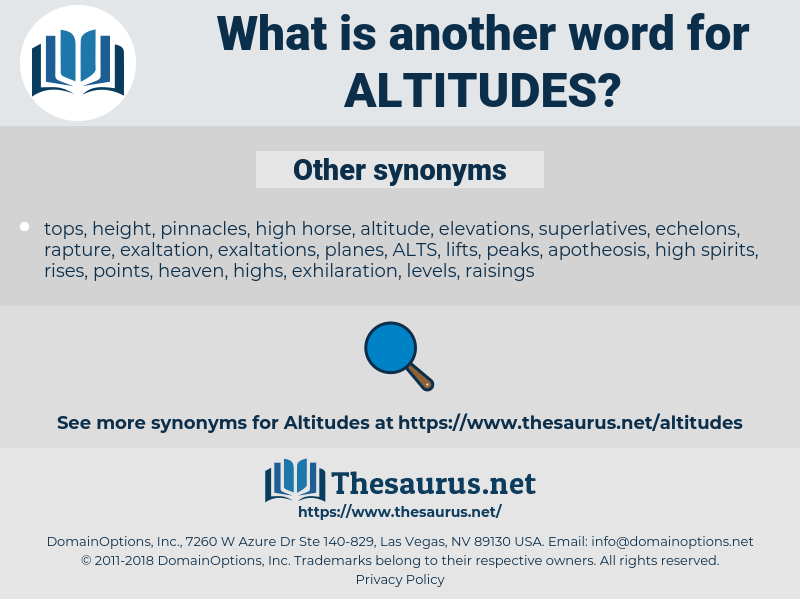 What is another word for altitudes? latitudes, heights, locations, times, levels, climbs, mountains, tiers, peaks, leaps, highs, occasions, Neighborhoods, districts, localities, Records, layers, lengths, stages, sides, edges, jumps, hills, advances, parts, hikes, up, increases, sites, premises, places, Gains, regions, surges, soars, zones, rising, Areas, Skies, storeys, venues, spikes, Rallies, rise, rises, ambitions, spots, mounds, Vacancies, Parties, scenes. The old burns in the middle altitudes of the park occupy regions once frequented by the Klickitat Indians. I also learned from one of the mates how to measure altitudes of the sun, and how to find the latitude each day. 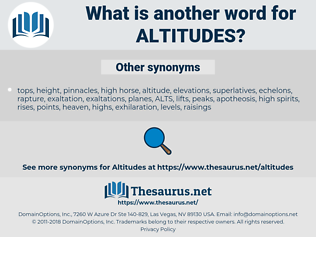 althea, alto, all-out, Aalto, allot, allied, alt, allude, alauda, Al Tawhid, alouatta, alloyed, al-tawhid, allhallowtide, ally with, alaudidae, a lot, aleut, alate, allotted, alated, Al-Hudaydah, auld, alidad, althaea, aloud, alidade, aldehyde, all the way, all too.